Larger stand-mount model in the Monitor Series sitting above the Monitor 50 model with MMP II cone, Black C-CAM dome and Hive II. 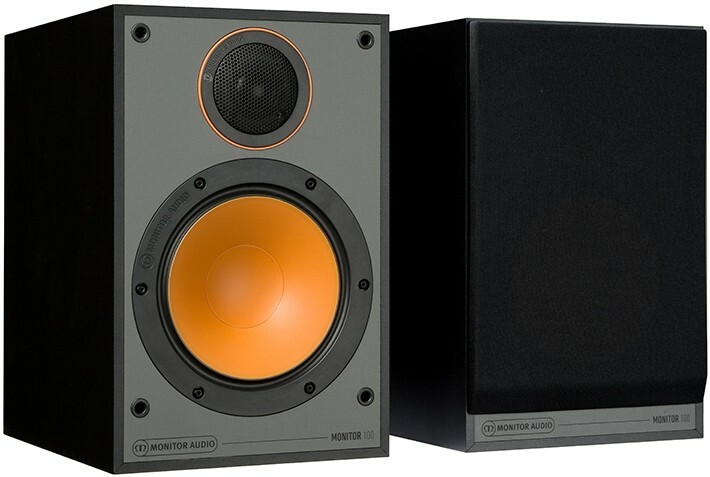 Monitor Audio Monitor 100 is a stunning speaker designed to be placed on a bookshelf or mounted on a stand. 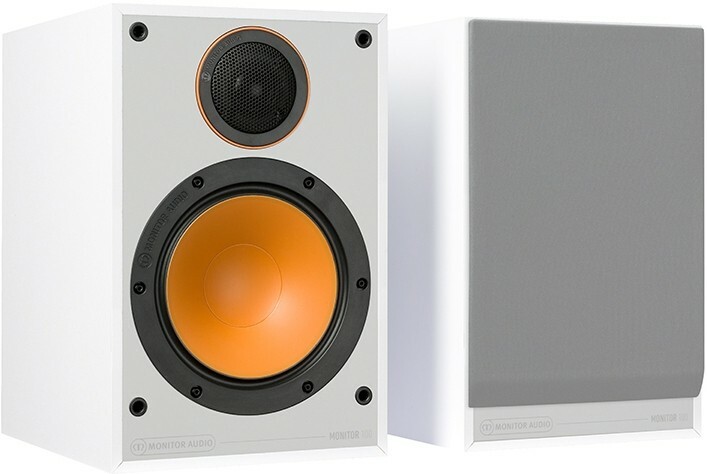 Featuring orange bass driver cones and dark C-CAM tweeters, they enchant both the ears and eyes. 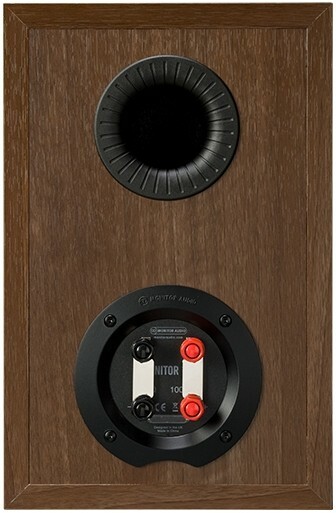 Twin sets of binding post terminals on each speaker enable bi-wiring or a bi-amp configuration. To preserve their diminutive proportions, and to allow positioning in the most restricted locations, the speakers are rear ported. The Monitor 100s accurately deliver the classic Monitor Audio sound. The output is well damped and is ideal for placement close to a wall. 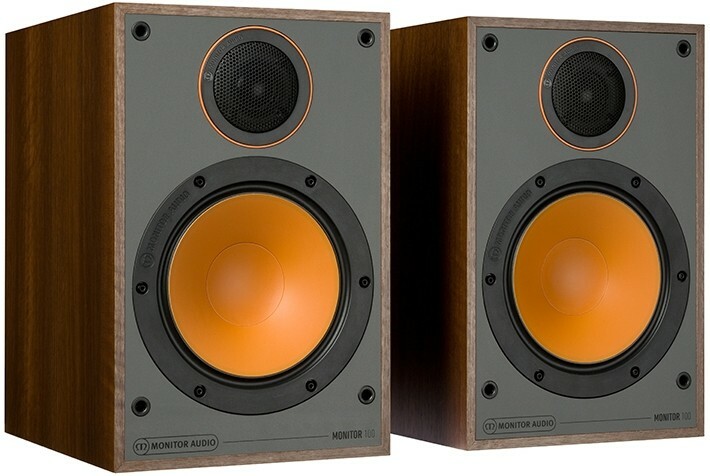 The speakers host all the class and style anticipated from Monitor Audio and are available in a choice of black, white or walnut. Their buoyant design and build guarantees that they will enhance any room. The Monitor 100s are beautifully proportioned speakers featuring a 6.5" MMP II bass driver complemented by a 25mm black C-CAM tweeter. With a larger bass driver and bigger cabinet, the 100s deliver a more expansive and punchy sound. Combining the C-CAM dome tweeter from Monitor Audio’s multi-award-winning Bronze series with a creative use of the drivers’ configuration, the speakers are tuned to deliver a true musical performance. Monitor Audio's creative use of 5.5" and 6.5" drivers have delivered a compact bookshelf, floorstanding model together with larger bookshelf and floorstander to complement larger rooms and higher power applications. The Monitor Series offers a meticulous resolution in either two or multi-channel setups.